List Rules Vote up the sea creatures whose transformations are downright unbelievable. In the wild, everything isn’t always what it seems. This is particularly true within the ocean’s depths. What you think is a rock could actually be a killer fish. What you think is a flower could also be a killer fish, and something you’ve mistaken for a sea shell might just be - you guessed it - a killer fish; but it’s more likely to be a man eating snail. You get the picture. Crazy sea creature camouflage comes in all shapes and sizes and happens for many different reasons. All you really need to know is that the ocean is brimming with shapeshifting sea creatures. These mysterious animals morph into their surroundings. This stuff is enough to invoke nightmares and it’s all happening right now in the depths of the ocean (and the shallow end too, just so you’re aware). Here are some of the most mysterious creatures of the sea, in all of their twisted, distorted shapes, colors, textures, and sizes. Which ones astonish you the most? 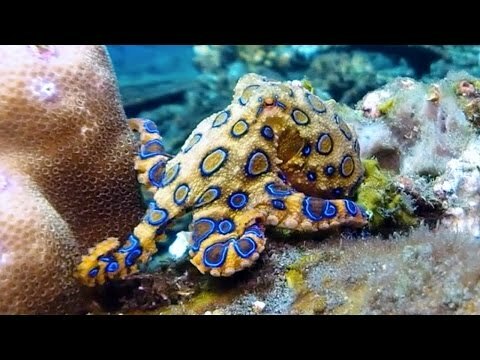 What makes the mimic octopus so mesmerizing, aside from its stated ability to change its shape, color, and texture at will, is that it’s smart enough to know who to impersonate depending on the given situation. It’s also ruthless enough to use this ability to lure in unsuspecting prey. Octouses are deadly enough, but this one here is no sucker. His fascinating yellow skin runs the full length of his body, which, incidentally, is only about two inches or so in length. Not only is the blue lined octopus tiny enough to be missed, but when his venomous tentacles turn a glimmering shade of blue, beware. That blue ringed getup means he’s dressed to kill. This little guy blends into the aquatic plants and coral to disguise itself. And usually when people figure out the octopus is hiding within the weeds, it's too late. Picture this scenario if you will. You’re floating through the rippling waters, a baby fish just enjoying a pleasant swim with mommy and daddy when suddenly, out of nowhere, mommy and daddy dart towards you, trying with all their might to eat you alive! But wait, you realize all too late, that wasn’t mommy and daddy after all. It was none other than the dottyback reef fish, a colorful saltwater swimmer whose whole modus operandi is shapeshifting to look like the parents of itty bitty baby fish and then proceeding to devour the little guys while still in costume. Nobody whips up a terrifying nightmare quite like Mother Nature. Southern pygmy leatherjackets are certainly full of surprises. Not only do they have the ability to puff up in order to intimidate fellow ocean dwellers, but they also have a unique color changing quality. They are known to switch colors during courtship. How romantic.